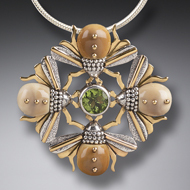 Lead designer Jenny Byrne received the prestigious Designer Jewelry Showcase First Place Silver Designer of the Year Award for her Bee Mandala pendant design in the Silver Jewelry under $500 Retail category. Entries were received from all over the world, representing some of the finest jewelry design talents of today. The competition was judged by three distinguished experts in the field: Alan Revere, Todd Reed and Merle White. Zealandia Designs is proud to announce that we were once again honored for our work. At the JCK Show in Las Vegas we were awarded Second Place in the Silver division of the 2007 Saul Bell Awards. 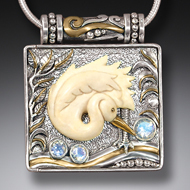 Our Egret Locket, designed for Zealandia by Satya Linak, was selected from a large creative pool of international designers. 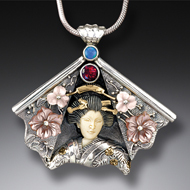 The Fan Geisha II, designed by Satya Linak of Zealandia Designs, was chosen as a winner in the Silver division of the 2004 Lapidary Journal Jewelry Arts Award entitled "The Face of American Art Jewelry."